Yves Saint Laurent, Christian Dior and renowned costume jewelry designers Larry Vrba and Iradj Moini are just a few names you can find at LuLu’s Vintage. Laurie Davis, the godmother of vintage in Chicago, travels around the country in search of the best selection of high-end vintage items for her Michigan Avenue boutique, filling her store with one-of-a-kind items dating from the 1920s to the 1980s. We caught up with Laurie to discuss some of her favorite pieces and the secrets to finding the perfect vintage addition to your wardrobe. MDPR: Where did your love of vintage come from? Laurie: My love of vintage actually started with jewelry. In the 60s, my family lived in Mexico City for three months. My mother used to take us on road trips throughout Mexico on the weekends. On a visit to Taxco, I discovered a world of fabulous sterling jewelry made by Mexican artisans. I was 16 years old and purchased an old (probably from the 40s), very large sterling bracelet. This started me on the path of collecting vintage jewelry. I still wear the bracelet to this day. MDPR: What are your favorite decades, designers and styles? Laurie: My mother wore beautiful clothing, and I always remember her getting dressed for an evening out. Beautiful brocade suits (à la Jackie O) from the 60s, needlepoint shoes and handbags. I cannot say that one designer is more fabulous than another. Each period of fashion has spectacular standouts. I am much more concerned about the fabrics and workmanship than the designer. People today are too label-driven. You do not need a label to be able to distinguish extraordinary pieces. MDPR: What is the best way to find vintage pieces in LuLu's? How can clients keep themselves from being overwhelmed when searching for items? Laurie: Many regulars that come into LuLu’s are looking for something unique and different to wear to an event. We specialize in being able to know exactly what will flatter a figure. Many times, the pieces we select are the pieces they end up with rather than the item they choose. We teach women what to look for in fit, where a dart should lay, what hem length is best for them, etc. They will also leave with a better appreciation for the history of the item they have chosen. MDPR: Often times the best treasures are buried and hard to find. What is your method to finding pieces for your clients? How do you know when you have found something really special? Laurie: We are asked all the time where we find the items. At the level we are purchasing (couture, etc. ), the items are coming out of private homes. I travel all over the country and need to purchase and entire closet, rather than hunt for a treasure I might find. My eye can discern something unique by the fabric and workmanship. I do not need a label. 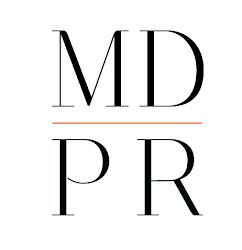 MDPR: Which pieces and designers are the best investments? Laurie: I think as a collector, one should just buy what they love. Buying for investment is for the serious collector who probably has very deep pockets. Collecting couture is like collecting artwork and the investment pieces are extremely costly, running into the thousands on many occasions. As far as jewelry, right now the designers to collect are Iradj Moini, Larry Vrba and Robert Sorell (all of whom we carry at LuLu’s). These gentlemen are true artists and all of their jewelry is made by hand in limited quantities. MDPR: Like I said earlier, many women like the idea of vintage pieces but aren't sure how to incorporate them into their outfits. What advice do you have for people who are just starting to explore and experiment with vintage? How can people match pieces to their personality and individual style? Laurie: Wow that is a hard question to answer. Of course shopping with someone who is truly an expert in the field always helps. You may or may not know I was a stylist with Marshall Fields for many years (when it was fabulous). Here is one key, if you put something on and you are not sure or you need to think about it, then it probably isn’t right for you. The reality is when something is fabulous, your body language will speak volumes. For example, many women start posing. There is really nothing to think about. Laurie pulled some of her favorite pieces from the store to showcase the best elements each decade has to offer. Fashion responded to the end of World War I with a trend toward simplicity. Clothing reflected a new found freedom by dropping waists to high hip levels and raising hemlines above the ankles and then the knee in 1926 during the flapper period. While the actual construction of apparel during this era was simple and loose-fitting, elaborate embellishments like embroidery, soft braiding, beading and fabric pinning gave this decade’s style a look of opulence and prosperity. Despite the Great Depression, fashion continued to evolve during the 30s. Keeping with the relaxed fit of the 20s, longer hemlines and higher waists created more conservative fashions. Synthetic fabrics were used for every day wear while silk was worn in the evening. Zippers replaced the hook and eye, even serving as design elements in some cases. Costume jewelry was also made popular by Chanel’s endless faux pearl strands while the “Hollywood” look began taking off as women used film as inspiration for their personal style. With Europe and Asia at war, European design houses set up shop in the states, indulging Americans in fashion. American designers also took advantage of this time to establish themselves in the fashion industry and create a following. Even though Americans were prospering, wartime restrictions on materials limited creativity, leaving the elaborate styles of the roaring twenties behind. A wide-shouldered, slim-waisted, narrow-hipped silhouette developed until Dior hit the runway in 1947. The design house created havoc over the “New Look,” which entailed rounded shoulders, exaggerated bust lines, corseted waits and padded hips. In this age of consumerism and conformity, style was fully embraced. The hour glass silhouette, created with crinoline and supportive garments - such as bullet bras, corsets and girdles - became the signature for 50s fashion. America paved the way for ready-to-wear fashion, leading with pencil skirts and the essential cocktail dress. Women left behind their traditional hats and gloves during this transitional period when fashion took a sharp turn away from the fussy styles of the 1950s as women began experimenting with new styles. As the baby boomers became independent and focused on expression, a more youthful silhouette developed, which included bright colors, busy patterns and showing more skin than ever before. The French “babydoll” look also became popular, which featured short skirts and big hair. As pop culture expanded, so did pant legs and platform shoes. In an effort to be expressive and demonstrate independence, decorated denim, metallic material and velvet defined the fashions of the 70s. Disco, wrap dresses, jumpsuits and ethnic inspired styles became icons, and tiny shorts and t-shirts became everyday garb. The 70s is now one of the most revisited and inspirational decades for new fashion. With the 70s over and women charging the workplace, oversized shoulder pads with fitted tops and loose bottoms took over as power dressing became the everyday norm in most households. Ralph Lauren and Calvin Klein surged in popularity, bringing with them bright and colorful accessories including bangles and large earrings. Several other iconic looks made their debut, including valley girl, prep and punk fashions. If you like what you see here, take advantage of Laurie’s three upcoming trunk shows celebrating fashion week where you can receive a 10% discount. The events will be held at LuLu’s Vintage, 900 N. Michigan Avenue. Wednesday, August 28, 5-8 PM: Vintage Couture Collection Champagne Reception.